Miami Heat Basketbal star Dwyane Wade went all LANGUICHATTE style last night!!! Like Austin Powers would says... Shagadelic baby, yeah! "Com'on man... We're not expecting a flood in Chicago are we?" Urbanmusic2000.com says... Last night marked another milestone moment for the Miami Heat baller that left Twitter and Instagram asking a confused and collective "What the F**K is this ni**a wearing?!?!" Answer... This ni**a is imitating a well known Haitian comedian... Actor Thedore Beaubrun aka Languichatte Debordus! 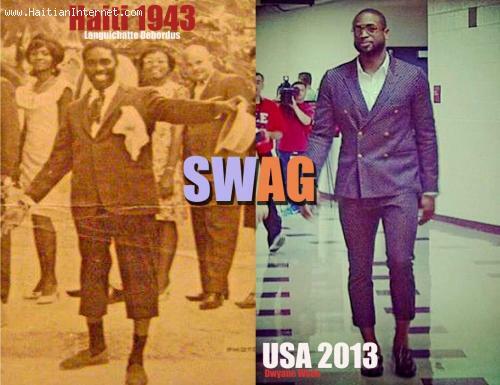 I never thought in my life Dwyane Wade would be imitating Languichatte Debordus.